We’ve been using Cateye Astrale “computers” on our bikes for decades, mostly to get the cadence function. After all this time, we pretty much know how fast to pedal, but old habits die hard. The cadence sensor counts pedal revolutions per minute, which requires a magnet on the crank arm. 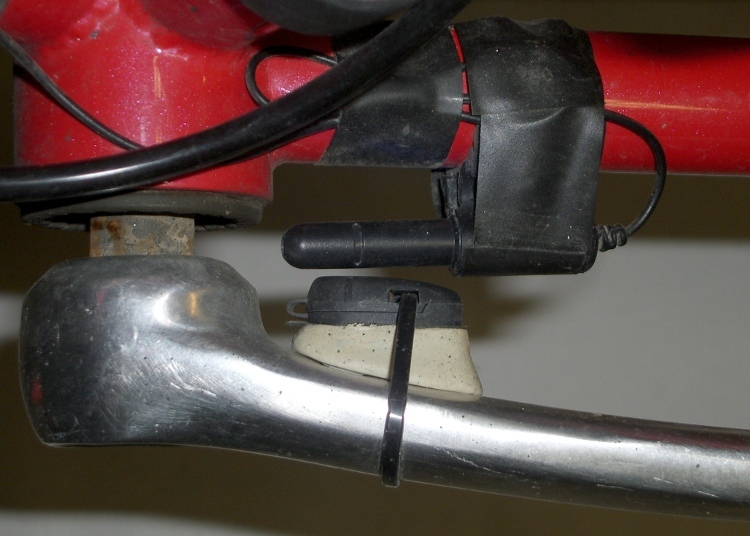 They provide a small plastic-encased magnet with a sticky-tape strip that’s worked fine on our previous crank arms. Our daughter’s Tour Easy arrived with fancy curved pedal crank arms that put the cadence sensor magnet much too far from the frame. You really want the magnet & sensor close to the bottom bracket so that it doesn’t get kicked and doesn’t snag anything as you pedal, but that just wasn’t going to work out here. A turd of JB Weld epoxy putty solved the problem: mix up a generous blob, shape it into a pedestal, glom the magnet atop it, adjust so the magnet is parallel to and properly spaced from the sensor, then smooth the contours a bit. Add the cable tie for extra security; you don’t want to lose the magnet by the side of the road! The black electrical tape is mildly ugly, but serves the purpose of keeping the cable from flapping in the breeze. The adhesive lasts about a year, then it’s time for routine maintenance anyway.